It is a quite simple method. In this method, we store the record in a sequence, i.e., one after another. Here, the record will be inserted in the order in which they are inserted into tables. In case of updating or deleting of any record, the record will be searched in the memory blocks. When it is found, then it will be marked for deleting, and the new record is inserted. Suppose we have four records R1, R3 and so on upto R9 and R8 in a sequence. Hence, records are nothing but a row in the table. Suppose we want to insert a new record R2 in the sequence, then it will be placed at the end of the file. Here, records are nothing but a row in any table. In this method, the new record is always inserted at the file's end, and then it will sort the sequence in ascending or descending order. Sorting of records is based on any primary key or any other key. In the case of modification of any record, it will update the record and then sort the file, and lastly, the updated record is placed in the right place. Suppose there is a preexisting sorted sequence of four records R1, R3 and so on upto R6 and R7. 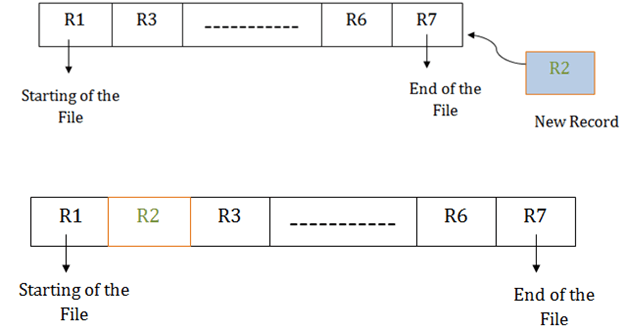 Suppose a new record R2 has to be inserted in the sequence, then it will be inserted at the end of the file, and then it will sort the sequence. It contains a fast and efficient method for the huge amount of data. In this method, files can be easily stored in cheaper storage mechanism like magnetic tapes. It is simple in design. It requires no much effort to store the data. This method is used when most of the records have to be accessed like grade calculation of a student, generating the salary slip, etc. This method is used for report generation or statistical calculations. It will waste time as we cannot jump on a particular record that is required but we have to move sequentially which takes our time. Sorted file method takes more time and space for sorting the records.